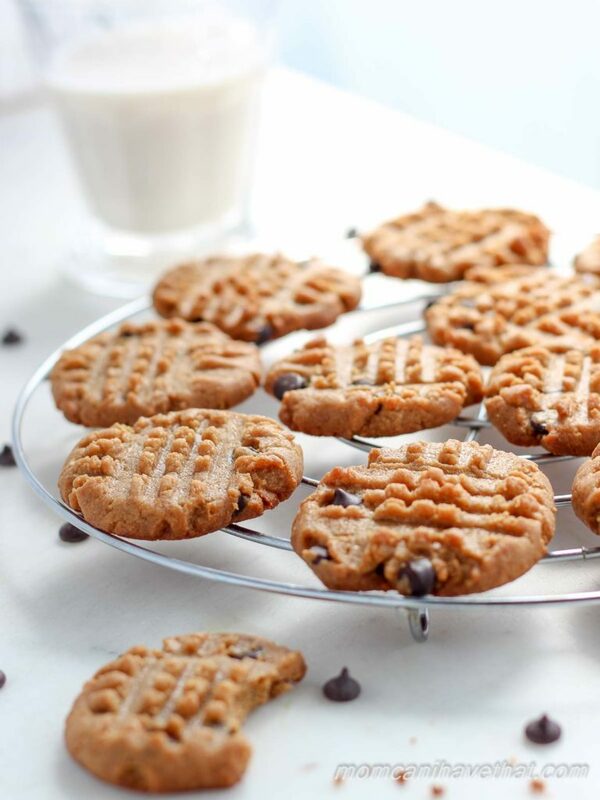 These Six Ingredient Low Carb Peanut Butter Cookies are so easy a 10-year-old can make them. Psst! they’re also low carb, gluten-free, dairy-free, keto and terrific! My kids have been begging for these low carb peanut butter cookies all week and I haven’t minded indulging them; putting one in their school lunch and letting them have a couple with a glass of milk as an after school snack. I’m careful to remind them that mommy’s treats are healthier than regular treats but that they are still treats and “treats are a sometimes food”. Unfortunately since starting this blog a year ago, my family has had access to more treats than in previous years. My son is beginning to expect dessert after dinner and he even gave me the “stink eye” the other day when I told him that there was none! But I do my best to provide balance throughout the week and how could I turn my daughter down when she finally (after many years) expressed a desire to bake with me? After proclaiming her boredom for the umpteenth time the other day, I pulled-up Pinterest and showed her how to do a search. She immediately found gluten-free things she liked and began to gather some recipes into a cookbook – a special cookbook for only herself and mommy to use together. 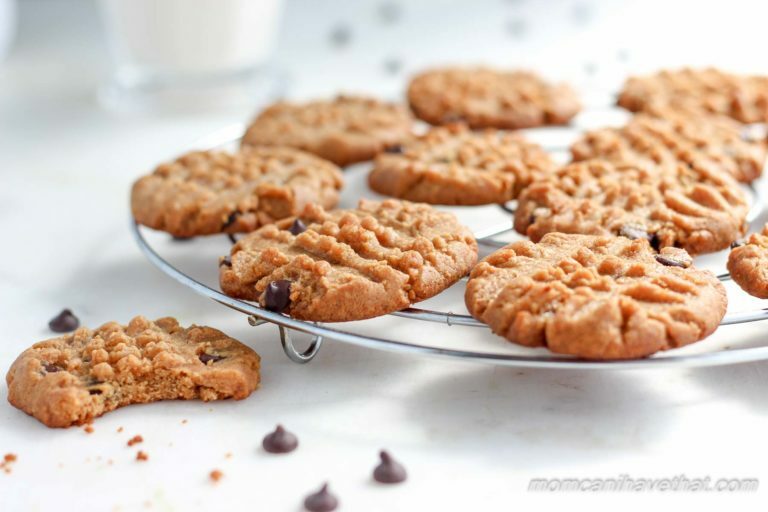 The original recipe for these peanut butter chocolate chip cookies was full of sugar, but we tinkered with it to make a great low carb and sugar-free version, and one easy enough for my 10 year old to prepare herself. There are a bazillion gluten-free peanut butter cookie recipes available on the internet using nothing but peanut butter as the base. Some call for sugar and others are refined sugar-free and some of the recipes work while others don’t. Many recipes use natural organic ground peanut butter and others use almond butter, but I just used regular creamy peanut butter from the grocery store — Skippy Natural Creamy Peanut Butter, and yes, it does have added sugar listed in the ingredients. Boo! This was the first time I used Lily’s Sugar-Free Chocolate Chips, which are sweetened with erythritol and stevia. For those of you unfamiliar with Lily’s sugar-free chocolate chips, I found them to be like dark chocolate in flavor and harder in texture than Hershey’s Sugar-Free Chocolate Chips which are sweetened with maltitol. Maltitol is a sugar alcohol which can cause blood spikes and/or intestinal distress in some individuals. I can detect a cooling effect in Lily’s chocolate chips and do not enjoy eating them out-of-hand, however, they are great in baked goods. FYI, I have heard that the Lily’s chocolate bars are very nice. Since I bought a case a few weeks ago, I will be using Lily’s chocolate chips for everything for a while, but you’re welcome to use your favorite low carb or low sugar chocolate in these peanut butter chocolate chip cookies. Have I mentioned that these cookies only have 6 ingredients? I know!!! Most of my recipes are pretty long, but NOT this one. 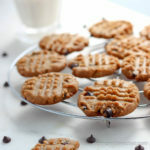 The original recipe called for 3/4 cups of sugar and 1 cup of chocolate chips, resulting in an overly-sweet peanut butter cookie with so many chocolate chips, that it was difficult to work with. Replacing the sugar with erythritol helped cut back on the sweetness, but it was still too sweet and left a nasty cooling sensation in the mouth upon eating. I settled on using 1/3 cup of Sukrin Gold which added a nice brown sugar flavor but using regular erythritol and 1/4 teaspoon of maple flavoring gives a good approximation. Since Sukrin Gold is a 1:1 sugar replacement and erythritol is not, add 1/8 teaspoon of stevia glycerite to bump up the sweetness a bit. I also used 1 T of the Sukrin Fiber Syrup Gold which helped the cookies brown a little better. NOTE: I like my desserts on the less-sweet side. If you want your cookies sweeter increase the Sukrin Gold to 1/2 cup OR add 1/16 – 1/8 teaspoon Stevia Glycerite. Let the cookies cool on the pan for a full 5 minutes before removing or they will break apart! They will be crispy once completely cool. I found it best to keep them in an air-tight container the refrigerator which helped mask any lingering cooling effect from erythritol and also kept the cookies crisp. 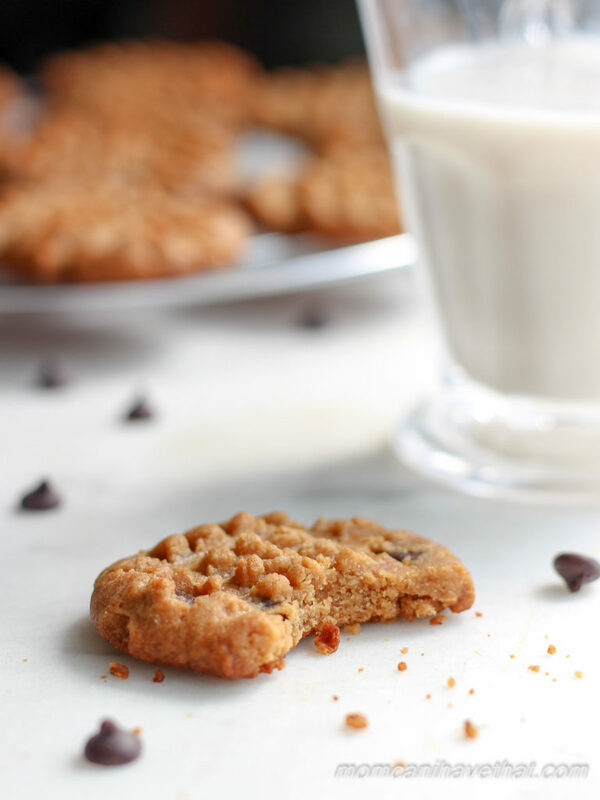 These Six Ingredient Peanut Butter Chocolate Chip Cookies are so easy a 10 year old can make them. They're also low carb, gluten-free, dairy-free, keto and terrific! 2 net carbs per cookie. Preheat oven to 350 and place the rack in the middle of the oven and line a sheet pan with parchment. Put the first 5 ingredients in a medium bowl and mix thoroughly with hand mixer. Add the chocolate chips and mix again. Weigh 1/2 ounce portions of dough, rolling them into a ball and placing 12 on a cookie sheet at a time. Push down with a fork in one direction and then the opposite direction, making the characteristic peanut butter cookie impressions. Bake for 8-10 minutes until the bottoms begin to brown. Let the peanut butter cookies cool for 5 minutes on the baking sheet before moving to a cooling rack to cool completely. Make sure to keep the dough in the refrigerator between batches. This batter performs best when it is cold! Store cookies in the fridge. Serving size is one cookie at 2 net carbs each. NOTE: DO NOT OMIT the Sukrin Fiber Syrup (or honey) or the cookies will crumble apart. I tried using gelatin and xanthan gum to hold them together and it doesn't work. You need all of the ingredients (except the chocolate chips) to make this recipe work. Each cookie is 2 net carbs! NOTE: I like my desserts on the less-sweet side. If you want your cookies sweeter increase the Sukrin Gold to 1/2 cup OR add 1/8 teaspoon Stevia Glycerite. Hey Kim! Thanks so much for the recipe! Although, mine weren’t crispy; they were soft even after cooling. but still delicious. I used 1/4 cup of powdered swerve and followed the rest of the recipe. Thank you! hi i used this recipe and it was very crumbly. do u know what might be the reason of that? do i need to add butter or flour? Hi, Instead of using the sugar you used, would it be okay if I replace is with Stevia? Do I have to put in the chocolate chips? Will it affect the cookies if I don’t? Also can I use liquid sweetner or will that be too wet? Where do you purchase Sukrin Gold? Can’t seem to find it. Have you ever tried the Lakanto Monkfruit -Golden Sweetner ? I really like the taste and it’s not overly sweet. One tsp is 0 calories, 4 carbs from sugar alcohols so not a big risk. If so, how does it compare to the Sukrin Gold?? Lakanto is similar and make from erythritol and monkfruit extract. Yum! Yet another fantastic recipe from your amazing collection! I used dried goji berries instead instead of chocolate chips as I didn’t have any chocolate in the house, and they still came out absolutely delicious. Like a fruit and nut tasty combo. Curious….,,, I’ve seen lots of recipes lately for cookies that are adding gelatin or beef collagen I was hoping that I would find them in a Pb cookie to help with the crumbling…. but hadn’t seen anything in the notes here about these ingredients as having tried them and why not being added etc. I made these and they are the best keto cookie I have made so far. I love this! This looks awesome! My kids would love this! First of all, these are AMAZING. They were such a hit, I thought I hit the Keto Lotto! However, 4 cookies later and they knocked me and my roommate out of Ketosis. We used the Swerve and Honey substitute because we couldn’t find the Sukrin in the store. With our substitutions, the Macros were per ONE cookie: 124 calories, 10g Fats, 4.5 Carbs(not net), 4.45 protein. We thought it was weird that it knocked us both out of Ketosis so we tried it again a few weeks later after we both were in Ketosis for over a week. Double checked all the measurements and once again it knocked us out of out Keto state. Both of us. We might try again using the Sukrin gold and see if that helps. But For those who are low carb or on Atkins. Good lord, you HAVE to try these! Curious if you were measuring before you had them. If you’re fat adapted, you likely are t measuring consistently in the urine strips regardless. The type of PB could have had sugar added so along with the honey maybe. Hi! Can I use crunchy peanut butter for this? I made recipe exactly as published. I weighed to 1/2 ounce before baking. If 1 gram of cookie is 2 net carbs, each cookie weighed around 15 grams after cooking. Is that correct, a single cookie is around 30 carbs?? Thanks, I’m so relieved because they are delicious!! How is it best to store these cookies as I would only eat 1 or 2 then pack for a couple of weeks. Should I put in freezer? They freeze really well, Sandi. Missing sugar in the nutrient facts, kind of crucial.. I know James. The program I use doesn’t include it. I have sent them a letter about it. I’ll begin adding the info to my recipes as soon as that feature is available. So sorry! Sorry, wasn’t trying to be rude.. thanks though! Blew me away that there are only 6 ingredients and they were YUMMY. I did not have Sukrin Gold or Stevia Glycerite (NEVER EVEN HEARD OF EITHER). Just used 1/2 cup of Swerve. Maybe they would’ve tasted even better if I’d had. But they taste great now! Perfect consistency (after cooling). I saved a bit of the dough and added some softened butter, those cookies were great too! What is the reason there was no butter in the recipe? Just curious. I think it is so special that you are sharing your cooking talents with your daughter. The peanut butter cookies sound fantastic. Never heard of Sukrin Gold… Will have to give that a try along with Lily’s chocolate chips. Thanks for the great tips. a healthy cookie that contains peanut butter and chocolate chips and only 6 ingredients? Sign me up! Yummy! And I just got my order of Sukrin Gold and Sukrin Fiber Syrup Gold!